The biggest change in QuickBooks® for Mac 2016 is hidden under the hood. A change in the way QuickBooks accesses the Mac’s memory, which previously required extensive modification of the entire code base, should make the application faster and more reliable. Although this took up the bulk of this year’s development cycle, the QuickBooks for Mac team also found time to add a few new features. The 2016 version of QuickBooks for Mac was completely overhauled to take advantage of Apple’s run-time memory model called ARC, or Automatic Reference Counting. While this is largely invisible to the end-user, this required the team to rewrite portions of the code for every window, form and button – a massive undertaking. The end result should be quicker and more stable files. While testing this summer, there appeared to be fewer incidents of the infamous “Working…” alert. Both the Single Activity and the Weekly Timesheets have been overhauled. The Single Activity has a cleaner, more modern look, and the Weekly Timesheet now includes the ability to sort columns and print. Not being able to adjust the column sizes on forms, such as invoices, has long been one of those small irritations for accountants used to working with the Windows version. Previously, form columns only resized when the entire form window was adjusted; there was no control over individual columns. 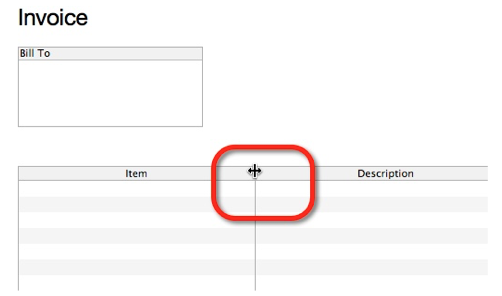 Now, users will be able to select and drag column separators to adjust column widths when working in all forms. The Print Checks, Purchase Order Invoice and Sales Receipt windows now all include a Print Envelope Button. The envelope printing function includes a number of built-in templates, but can also use customized templates. The envelope template selection is controlled from the Preferences window. The transaction Importer, which was introduced in QuickBooks for Mac 2015, now includes the ability to import Sales Receipts from Square. Last year’s release included many new features, including batch transaction importing, drill down on sales tax reports and a budget redesign. This year’s update was just as huge, but in a way that is not immediately obvious to the user. The redesign of the memory system should result in performance improvements that will benefit all accountants and their clients just as much as a showy new feature. QuickBooks for Mac 2016 is included with your QuickBooks ProAdvisor® subscription. It will only run on Mac OS 10.10 (Yosemite), or the soon-to-be released Mac OS 10.11 (El Capitan).